Amazon.com description: Product Description: Frank Miller, along with co-writer Brian Azarrello and artist John Romita Jr., revisit the gritty world of to the best-selling and genre-defining graphic novel, THE DARK KNIGHT RETURNS, with this time telling prequel, THE DARK KNIGHT RETURNS: THE LAST CRUSADE, The tale of Batmanâs last adventure before his retirement and eventual return years later. As the Joker is manically returned to Arkham Asylum, Bruce Wayne is struggling to train his sidekick and heir apparent, the new Robin, Jason Todd. While a new string of bizarre killing sprees involving Gotham Cityâs elite take up Batman and Robinâs attention, critics begin to question if the Dark Knight has a right to endanger the life of a child. What does night after night of danger and brutality do to a child? And what is the Joker planning? 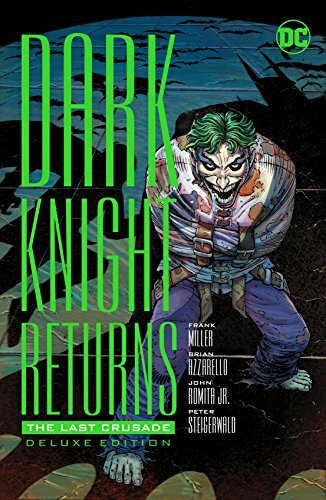 THE DARK KNIGHT RETURNS: THE LAST CRUSADE presents this prequel story to THE DARK KNIGHT RETURNS in an oversized hardcover edition, along with the storyâs original plot, pencils and variant covers.